UP CLOSE AND PERSONAL WITH OUR LOVELY AGENTS! I’m the Brand Manager for Little Lies and also the Co Owner of The Make Agency. customers and product that we love everyday single day is an absolute privilege and is something we really remind ourselves not to take for granted. 1) What is your favourite LL piece that you can’t take off right now? My favourite LL piece - hmm it’s hard to choose from this season but I am absolutely loving the Aspen Coat and I’m also obsessed with the new knitted pants that have arrived in! 2) What do you love most about A/W time with LL? As a Melbournian, Winter is my favourite fashion season. I’m all about layering and I LOVE LOVE a good Winter coat. 3) Trends you are loving right now! I’m loving wide leg pants this season, teamed back with a cool sneaker for a dressed down look. Hi, I’m Natasha AKA Tash. I have always had a passion for fashion, I have been a brand manager for over 12 years and I have worked with many amazing labels in this time. fashion is a great creative release. New trends excite me but I also love mixing new with vintage to create a unique look. At the moment I am loving my escape kimono (wearing) ramie linen pants and bubble knit cardi!! LL is perfect for our weather, so many great layering options for the tran-seasonal period. The relaxed shapes and beautiful soft and natural fabrics are a must have for any Aussie girl. Hi I’m Laura AKA the energetic, bubbly Scottish lassie that moved to Australia two and a half years ago. Has to be the Bubble cardi!! Little Lies always gets the fabrication spot on and produces the softest and most incredible knitwear but this is on another level…it’s like wearing a hug!!! 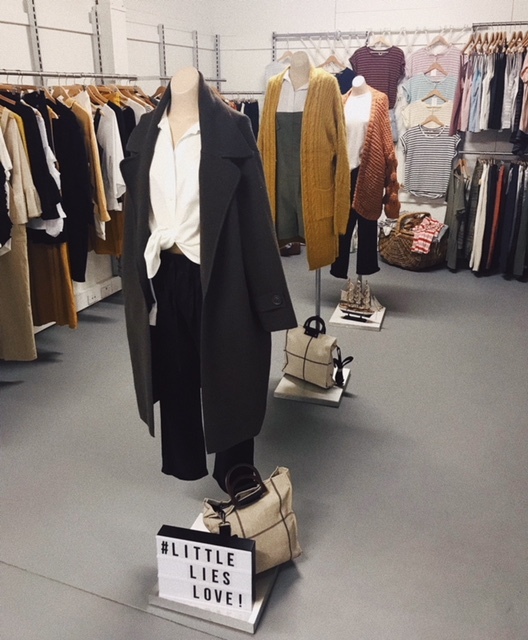 I love how LL takes you through every stage of Autumn and Winter and bring out pieces that you can carry right through because they are so easy to layer and are always relevant. Not to mention the fact that A/W is typically when my wardrobe grows to the point of bursting when every single, cardi, jumper and coatigan are an absolute must have!! I love the effortlessly cool look of a black skinny jean, printed tee and checked blazer (the Alicia Jacket is ideal when creating this look)! Wear during the day with a little black boot and then stick on a pair of heels to head straight out for drinks after work. My name is Sarah and I have worked in the fashion industry for 8 years over in Wholesale, retail and now sales, love seeing every facet of the industry and working on all sides. The aspect about my role is working with all the different stores and buyers and meeting so many amazing people! Aspen coat is hands down my fave! Love the simplicity of it and that I can style it back with my check mini skirt or ripped jeans! Cant wait for it to be freezing to wear it everyday! The versatility of everything, I have a fairly basic style so love how easy it is to grab a LL piece and throw together an outfit! I can wear all the pieces together and it works every time! Mini skirts, knits and oversized coats!!! And anything checked!! And the Bubble knit on Bronnie is incredible!!! Today I had on the Friday knit and aspen coat!